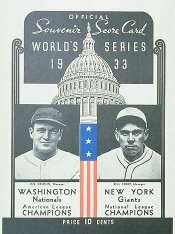 The 1933 World Series featured the New York Giants and the Washington Senators, with the Giants winning in five games for their first championship since 1922, and their fourth overall. 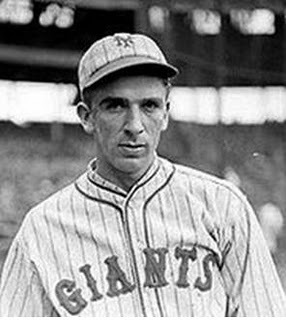 The Giants easily defeated the Nats behind "King" Carl Hubbell and "Prince" Hal Schumacher. Washington, D.C. has not hosted another World Series since 1933. Game 5 was the final Series game played in the nation's capital as of 2009. This Washington Senators franchise became the Minnesota Twins during the 1960–61 offseason, and would not reach the World Series again until 1965. The second Senators team became the Texas Rangers. The transfer of the Montreal Expos to become the Washington Nationals opens the door to D.C. again potentially. In 1933, few teams had as productive a batting order as the American League champion Washington Senators. Heinie Manush hit .336 and had ninety-five runs batted in, Buddy Myer finished with a .302 average, Joe Kuhel contributed with a .322 and one-hundred seven RBIs and Goose Goslin and Fred Schulte were .297 and .295 sluggers. Hitting wasn't their only weapon as Alvin Crowder won twenty-four games, Earl Whitehill had twenty-two victories and Lefty Stewart went 15-6. The Senators had outdistanced the defending champion New York Yankees by seven games for the American League pennant and were heavy favorites over the National League's New York Giants. In stark contrast to Washington's "lumber yard", New York's team had only one .300 hitter in Bill Terry and one one-hundred RBI man in Mel Ott. What they lacked in offense the Giants certainly made up for in defense with Carl Hubbell, Hal Schumacher, Freddie Fitzsimmons, Roy Parmelee and Dolf Luque on the mound. Hubbell had led the National League in victories with twenty-three, shutouts with ten and earned-run average with a 1.66. Schumacher, Hubbell and Parmelee had ranked 1-2-3 in the league in fewest hits allowed per nine innings. Schumacher had won nineteen games, and his 2.16 ERA ranked third in the National League. Fitzsimmons had won sixteen. And reliever Luque, at forty-three, had won eight-of-ten decisions and boasted a 2.70 ERA. Hubbell and Schumacher, who had combined for seventeen shutouts, started the first two games of the Series for the Giants and were opposed by Stewart and Crowder. Hubbell did not permit an earned run while allowing only five hits and striking out ten in a 4-2 opening victory that featured an Ott two-run homer and run-scoring single. His teammate surrendered only one run in Game 2 (a Goslin homer), and wound up a 6-1 winner as the Giants erupted for six runs in the sixth inning. Pitching continued to rule in Game 3 although this time it would be Washington on top. Earl Whitehill, who was a key off-season acquisition from the Detroit Tigers, threw a crucial five-hitter that resulted in a 4-0 victory and put his team back in the hunt. Hubbell returned for Game 4 and did not allow an earned run for nine innings in a 1-1 tie. Neither club could score in the tenth, but the Giants pulled ahead in the eleventh on a Travis Jackson bunt, a sacrifice and Blondy Ryan's single. The Senators were unable to answer and New York held on for a 2-1 win and one game away from their first championship title since 1922. Schumacher was given the start for Game 5 and looked strong with a 3-0 lead going into the bottom of the sixth. Down, but now out, Washington came alive with a Fred Schulte homer that brought in Heinie Manush and Joe Cronin for the tie. Now the game turned to a duel of the relievers as the Giants' Dolf Luque squared off against the Senators' Jack Russell for the win. The 3-3 stalemate continued until the top of the tenth when Ott drilled a Russell pitch deep into the bleachers. Luque (who had first appeared in the majors in 1914) then went about the business of nailing down the Series title for the Giants. In the end, New York batted .267 in the Series (slightly above its season figure of .263) and Washington hit .214 after leading the majors in 1933 with a .287 team mark.